123 Color HD: Talking Coloring Book app has been around for a while however quiet enhanced from its first version!. Available for iPad, iPhone/iPod and currently free (just for today? 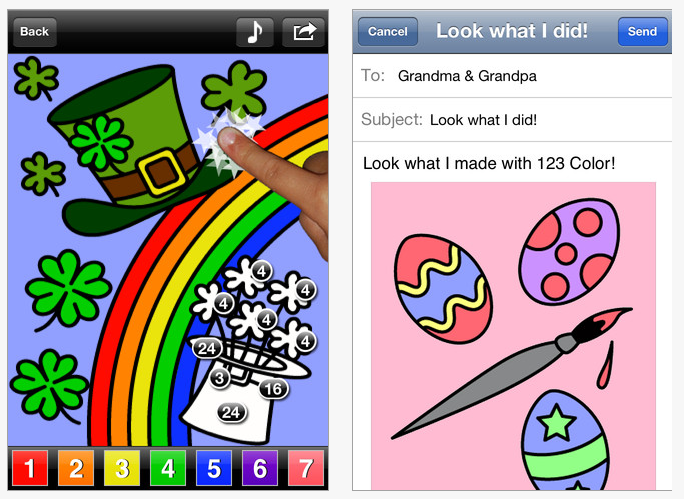 ), this app provides coloring pages for elementary students with fair to good coloring skills. A Premium version is available for 4.99. As a coloring book app this app comes with additional features of color by number, color by letter, talking palettes that speak the colors on the palette as well as subtly provide the written word, a nice feature for students needing visual and verbal reinforcement. Although the coloring or cartoon pages provided in the basic app have pictures with a lot of detail, suited primarily to elementary aged students, when you color the color stays in the lines creating greater success for students (especially those with a perfectionistic side or those with limited motor control. Use with younger students is also appropriate when using Photo Painting (see discussion below). Other coloring choices provided is a Shapes coloring book which features coloring sheets with multiple shapes of squares, triangle, pyramids, cubes, concentric circles, wedges, ovals, cones, parallelograms, trapeziods and hexagons, suited to elementary aged students at the 1st or above grade level. A cool coloring book feature of the app is the World Map coloring page. It provides a single coloring page of the world that when colored or tapped provides you with an immediate link to the Google Earth page of the country or ocean you touched. Sizing of the color or paint strokes is offered. Another option available in the basic 123 Coloring Book app is their Stationery Coloring Book providing Lined Paper of different colors, Lettering Paper (has top, middle and base or bottom lines for letter formation and alignment practice) as well graph paper (although a small grid). The Letter Paper provides a nice choice of paper for handwriting practice if needed. 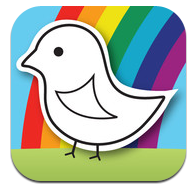 Settings of this app provides many options of size of color by number letters or numbers, turning the music on or off, type of reward songs, choices of music or coloring book themes, language, color palette size, choice and layout and more! Additional pages and concepts are available as add-on purchases with the value pack coloring books ranging from 3.99 – 5.99. There are handwriting practice sheets, holiday and topic theme coloring books. One of the packs has a complete world map set. Although the basic app coloring sets are for more mature elementary students in my opinion, this app can be used for modifying worksheets or drawing on pictures similar to Doodle Buddy as described in the post sited above. One difference between Doodle Buddy and 123 Color however is Doodle Buddy allows typing on the screen whereas 123 color is only drawing and painting – pending the task you are doing. 123 Color: Talking Coloring Book has many other features and easy access to the tools I believe. Currently free, or even if $.99 this app has many features worth using with students in your OT sessions. 123 Color HD: Talking Coloring Book is worth considering for your OT iTool Kit if you work with middle school or younger students, whether free (today) or for $.99 in my opinion! 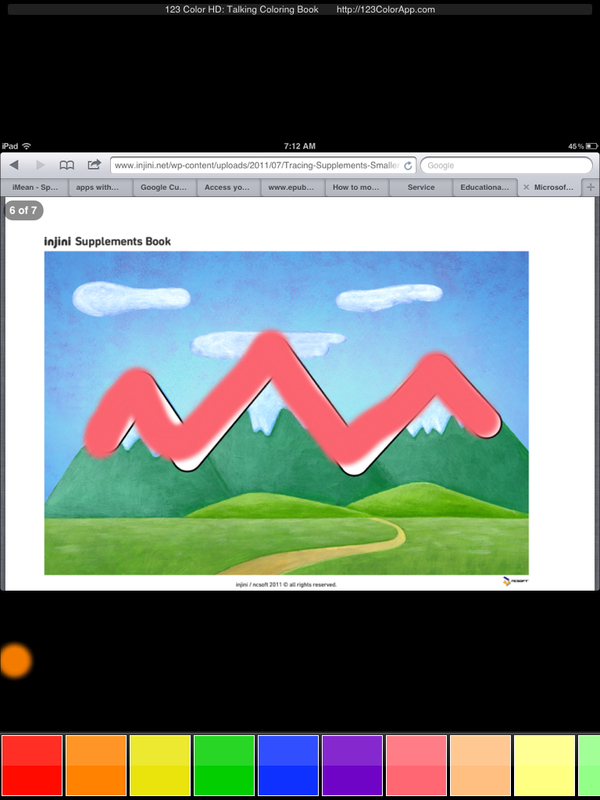 This entry was posted in Activity Worksheets on Your iPad, App Reviews, Apps for OT's, Apps for Special Needs, AT for Handwriting, Drawing, Early Childhood, Fine Motor Development, Finger Isolation, Handwriting, iPad, iPhone, iPod, Maps, Middle School, Occupational Therapy, Pre-writing, Special education, Visual Motor and tagged App Review, apps for fine motor, Drawing, Fine motor apps, iPad, iPad accessories, iPhone, iPod, occupational therapy, OT Apps, special education. Bookmark the permalink. Hi Nicole, What year are you in school? Thank you for your comment! There are so many great apps for students! The iPad is used a lot for a wide variety of students in our school. Good luck with your placements for your clinicals!